This listing allows you to buy 6 pads at once! They are our 10 inch size in moderate absorbency. The Cozy Folk 10 in moderate is our most popular size; folks typically use it as a daytime pad during most average days of their period - and often on the heavier days too, if changed more frequently. ***** Please LET US KNOW if there are colors or patterns you DO NOT want or really really want! The listing photo features some but not all of our current prints. 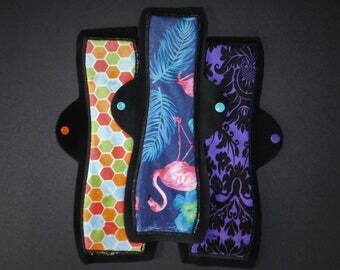 *Exact appearance of pattern on pads varies pad-to-pad. *Snaps may or may not be the same color as pictured. **Our first priorities are comfort and functionality. If you want your pads to be perfectly symmetrical or prefer it to be slightly asymmetrical, please leave us a note about it. 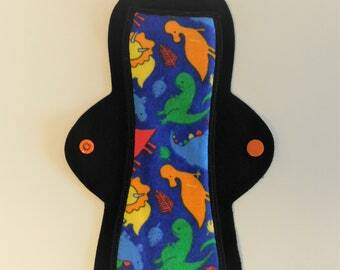 Set of Reusable Pads (12" Heavy) ------Great for Postpartum, Overnight, and folks who want more coverage! 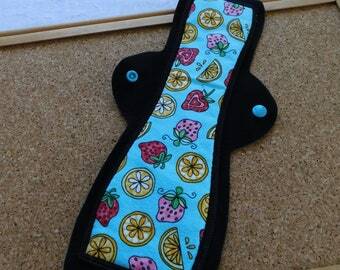 Multi-pack Set of Reusable Pads (12" Moderate) ------Great for Overnight! I love these, I started with the sampler pack of 3 sizes to find the best fit and these work great for me. They wash up fantastically too. Highly recommend! Useful and well-made. Probably worth the higher price. Great size for my normal days & super soft. Thanks! HOW DO I DECIDE WHICH FABRIC TOP IS RIGHT FOR ME? FLANNEL is natural (100% cotton), thin, breathable & fuzzy like pajamas. The appearance may change over time, but this won't affect the pad's functionality. JERSEY is a synthetic fabric made in the U.S. with eco-friendly production. It's extremely thin, lightweight, & breathable. Special wicking fibers quickly move moisture down into the absorbent layers, keeping you dry & comfortable. MINKY is a silky soft, synthetic fabric that is stain-resistant. It is slightly thicker & warmer than flannel or jersey, so it may not be ideal for hot climates (though it’s still much more breathable than disposables). **Direct experience with the fabrics may be the best way to find what you like, and a mix of fabrics can also suit some folks! Our ability to do these depends on the time of year and the type of request. We would love to hear from you and see what we can do! We can definitely do things like any absorbency level on and length pad. Fabric-pad size combos we don't currently have listed, etc. 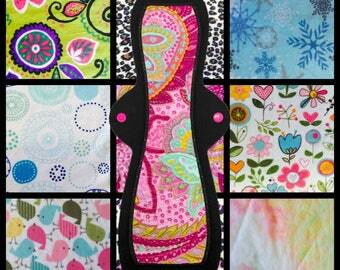 Want to have us make pads/liners out of fabric you have?!? We are currently in development stages of creating a couple thong-liner options. WHAT ARE COZY FOLK PRODUCTS MADE FROM? Cozy Folk pads & pantyliners are backed with Polartec Wind Pro 100% polyester fleece (manufactured in the United States). They’re topped with your choice of conventionally grown 100% cotton flannel, 100% polyester jersey, or 100% polyester minky. All absorbent cores contain conventionally grown 100% cotton flannel; Moderate & Heavy flow pads also have additional layers of bamboo fleece (70% viscose rayon from bamboo + 30% organic cotton). They are sewn with a combination of heavy duty & extra soft nylon threads. Bamboo fleece is one of the best absorbent fabrics available, and we source ours from a factory that uses a "closed loop" system to minimize environmental impact. ARE COZY FOLK PADS VEGAN? Yes. Cozy Folk cloth pads contain no wool, silk, leather, or other animal products. Everything else we sell is vegan-friendly, too. WHAT ABOUT USING CLOTH PADS FOR INCONTINENCE OR LEAKAGE? 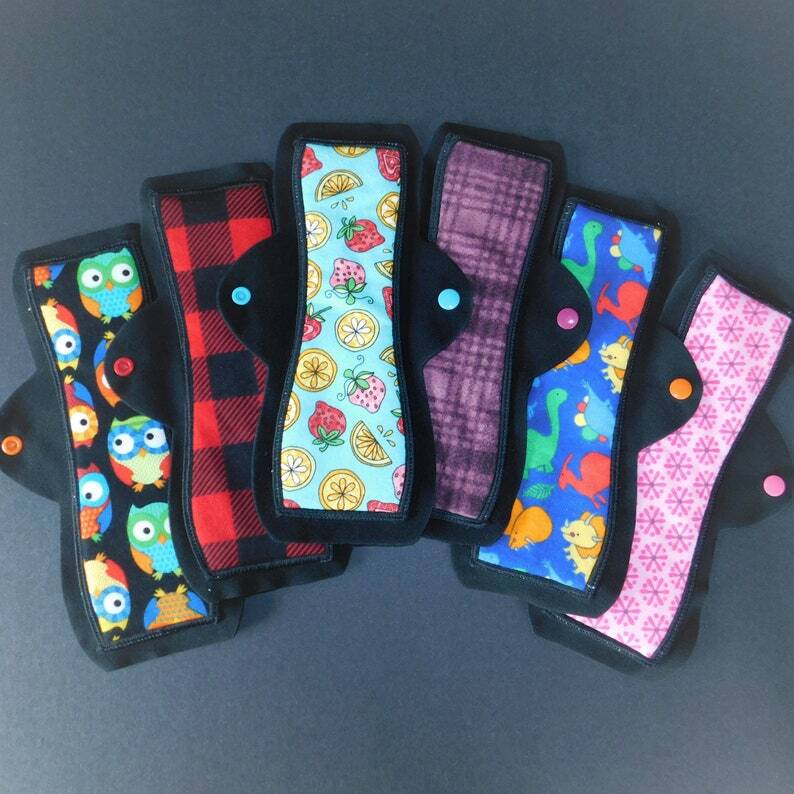 Cozy Folk cloth pads also offer an alternative to disposable products in these categories-- to an extent, though they may not replace full diapers or work as easily in situations/ages where one is not doing their own laundry. 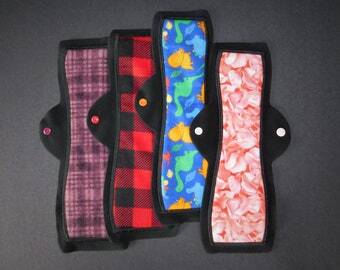 Our largest size is 14 inches long with two absorbent Bamboo Fleece layers. Our 10, 12 and 14 inchers have one end that flares out larger, you may find that you prefer to have that end in front, depending on your urethra location, etc. You will want to use FLANNEL or JERSEY pads for incontinence. Minky does not absorb urine rapidly enough. People also use smaller liners for mild leaks and discharge. PUL waterproof layer can be added under absorbent layers upon custom request. CAN I USE COZY FOLK CLOTH PADS FOR PREGNANCY & POSTPARTUM? Yes, cloth pads are a wonderful choice for new moms! If you experience frequent discharge or urine leaks during your pregnancy, pantyliners can also be very helpful. Once your baby arrives, the bleeding can be quite heavy for the first few days. We recommend wearing a larger pad than you normally would and having plenty of pads ready so that you can change them frequently. If you'll be cloth diapering your baby, you can wash your pads in the same laundry load - keep this in mind when deciding how many pads you'll need. 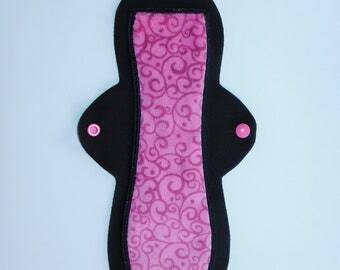 Of course, once your regular period returns, you can continue to use these pads during your cycle! CAN ANYONE USE CLOTH PADS? WHAT ABOUT "MAMA CLOTH"? If you’ve ever used a disposable pad or tampon, you can use cloth! "Mama cloth" is just another name for cloth menstrual pads, though at Cozy Folk, we tend towards more broad/inclusive terms. After all, mothers aren't the only people who menstruate! We warmly welcome people of all ages and genders. 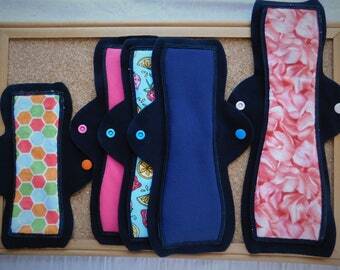 If cloth pads have the potential to improve your life in some way, we want to help! We also strive to provide gender-diverse, non-binary, and queer friendly products. To prevent leaks, Cozy Folk pads are backed with premium water-resistant Wind Pro fleece. This is used as a softer, more breathable alternative to the polyurethane laminate (PUL) used in many brands of cloth pads. **As long as you use the appropriate absorbency pad and change your pad within a reasonable amount of time, leaks shouldn't be an issue. ** However, if it’s your first time using cloth pads, you might want to just wear them around the house for a couple days until you become more comfortable with them. If you find that the way or length of time that you want to wear your pads could be improved with a PUL layer addition, we are open to custom orders and have the material on hand.